Brave and the Bold #28, “Firing Line,” by J. Michael Straczynski and Jesus Saiz occupies an unusual niche for the Flash. While Barry Allen has been back for a year and a half, this marks his first real solo adventure in an ordinary comic book format since his return. Flash: Rebirth is very much a transition, more setup than story, and while Barry certainly has the spotlight in that book, he shares the stage with a host of other speedsters. Wednesday Comics came close, but was very much caught up in exploring the alternate format. Calling a team-up story a solo adventure might be pushing it, but this does read much more as a Flash story than a Blackhawk story. It’s told from the Flash’s point of view, the key dilemma is a decision the Flash has to make, most of the Blackhawks are indistinguishable from each other, and a group known for air combat spends the entire issue grounded. At its heart, the story uses the clash between two classic comic book genres to ask the question: “When is it acceptable to kill?” The Flash — perhaps the example of the Silver Age superhero: slightly goofy, with crazy science adventures and a code against killing — is dropped into the middle of a war, unable to leave until an injury heals. And not just any war: World War II. On that level, it works. The Flash’s idealism and the Blackhawks’ determination contrast well, until he finds a way to align them. Jesus Saiz’ artwork feels a bit stiff and static during the Silver Age-style framing sequence, but is well-suited to the war story that takes up the bulk of the issue. 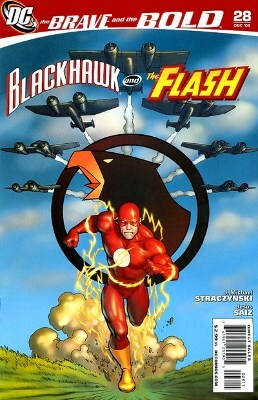 The coloring also highlights the contrast between the Flash’s bright red costume, the Blackhawks’ dark blue, and everything else in muted grays and browns. It also manages to avoid the stilted dialog that occasionally crops up in JMS’ writing. Every once in a while I’ll be reading something and a line will leap out as either very awkward, or a quote from Babylon 5. That didn’t happen even once here. Well, for one thing the Blackhawks don’t come off as legends. They don’t even really come off as the Blackhawks. They could be any military outfit, and I honestly can’t tell why Straczynski chose to use them over, say, Sgt. Rock and Easy Company or anyone else. The framing sequence is cringe-worthy to anyone who’s taken high-school physics. Changing the “vibrational properties” of light? Wouldn’t that simply be changing its frequency, i.e. color? And then there’s getting relativity backward. If the Flash moves at near-lightspeed, time dilation will slow time down such that what seems like moments to him will actually seem longer to an outside observer — but the narration describes it as being the other way around. (Speedsters are often shown perceiving time as if the rest of the world was in slow motion, but the narration here is very specific about it being near-light velocity that’s causing the effect.) Seeing both of these in the first three pages got the book off to a bad start, but at least it did pick up. Also, Barry’s awfully mobile for someone whose leg is broken in two places. Except we know one time that he did, or will: he killed Professor Zoom in order to prevent a murder. And it was such a major upheaval in Barry Allen’s life that it dominated the last two years of stories before his series was canceled and his character killed, taken off the playing field for two decades. So yes, killing is a major issue for the Flash, whether the framing sequence takes place before Crisis on Infinite Earths or after Flash: Rebirth. His answer to the question also makes for an interesting contrast with the portrayal of Hal Jordan in DC: The New Frontier. In that story, long before Hal becomes a Green Lantern, he’s an American military pilot in the Korean War who makes every effort to protect his comrades-in-arms without actually killing the enemy. For that version of Hal Jordan, survival is the only justification for killing…and the one soldier he had to kill still haunts him. Some things that will probably stand out for long-time Flash readers: Normally the Flash can travel through time on his own, so you’d think being trapped in the 1940s wouldn’t be an issue. But the Flash’s time travel is always round-trip. If he jumped to the present on his own, he’d eventually return to 1944. Add in the broken leg, and it makes sense that he not only has to leave by a particular method, but has to wait. Then there’s the blank-eyed mask, which I suspect is going to be one of those things that is going to take a long time for artists to catch up on. (Barry Allen’s mask has always left his eyes visible. Wally West’s costume was redesigned at one point with blank white eyes, and has gone back and forth depending on artist.) It didn’t bother me in terms of continuity, but certain expressions just looked wrong with the blank eyes. I can’t quite convince myself that it wasn’t intentional, though, because a big part of the story is about identity, and the mask itself is a symbol of that. Overall, it’s an interesting, thought-provoking story. This entry was posted in Reviews and tagged Barry Allen, Blackhawks, Brave and the Bold, Jesus Saiz, JMS, World War II on October 21, 2009 by Kelson. I was puzzled about that too, but I think it works. The Blackhawks can’t fly just as the Flash can’t run, but only Flash is out of his element. While the Blackhawks may seem like comic book superheroes, their heroism adheres to a different ethos. They’re soldiers. Liked the issue, even though my issue came in late thanks to ups losing one of the comic store’s boxes. Also I think Kelson wrote a great review. Hmm, yeah, neither of the stars gets to do much of what they’re known for. It was pretty decent, but I just don’t see Barry throwing on a uniform and shooting Germans. I thought about it as soon as he talked about “his country”. Barry always seemed more like an international type to me – if you’re in JLA you’re working for the greater good of the world. Obviously he was primarily working in Central City, but he just never seemed like the AMERICA NUMBER 1 AMERICAN FLAG UNDEROOS! type. Obviously the Germans are ‘evil’ in this case, doing all kinds of bad things, but I just don’t see Barry shooting people like that. Especially Wehrmacht grunts who likely didn’t do anything. Could you please not generalize in your post about Germans, I have German heritage and even though I don’t know alot about Germany, I do know that some native Germans fought the nazis. Also several nazis such as Hitler were Austrian by birth but called themselves “Germans”. Sorry but I felt I had to say something. Great review there – just been babbling on about the issue myself at my blog, but in a less-educated manner. I liked that although Barry took up the gun, we don’t know that he killed. .-= Martin Gray’s latest blog post: The Brave and the Bold #28 review =-. Good review … the blank eyes caught me, too – just because there are such subtle differences between Wally’s (awesome blank eyes, maroon) costume and Barry’s that the little differences really important to keep track of. but, more importantly to me was the continuity gaff that Barry’s leg took weeks to heal. Don’t they have fast healing powers? that’s been shown many times. Overall, though, I really liked this story as it addressed head-on an illogical contradiction about killing that has always existed in comics, and often is glossed over. I’m still wondering when in Barry’s career (pre-Flashpoint) did this take place? is it an untold tale from Barry’s pre-crisis career (in which Time travel was in every other issue) or was it after he returned from the Speed Force in Flash: Rebirth?